I added some sweet chemical graphics today. I've done Alchemic Acid, Sonar Cells and Base Chemicals. It's taking a long time but I'm pretty happy with the look so far. 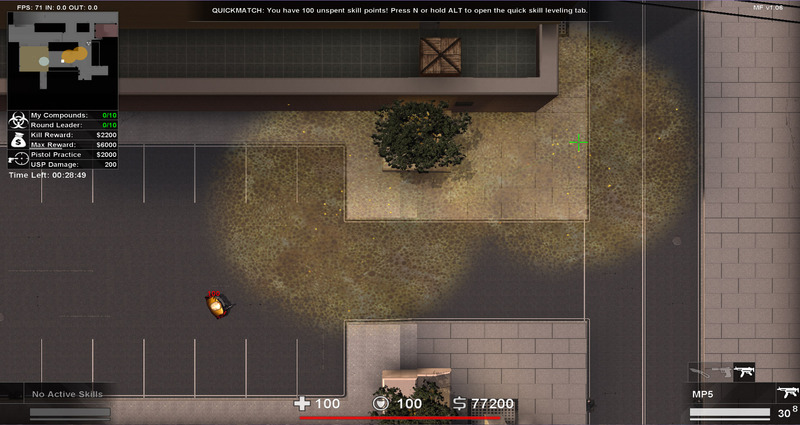 I've also added graphics for insulating and deinsulating chemicals and got a few nice particle effects going on. One of the most tricky things to do so far was to get the chemical to "paint" onto the map. This way we can place a chemical on the edge of a building and have it display on the building but not go off into space like Radiate or something would. The effect is really quite nice. I hope to release Chemical Warfare by this weekend. Stay tuned! Looks good but isn't this a bit too much. I mean, all chemicals should at least share one effect to immediately distinguish them from other map effect and to somehow unify their look. Or maybe I just don't get those particle effect until I see them live. It's just that all the chemicals looks so different, If they looked similar it'd make it easier for new players to actually know what they are. This is true. But I also need to make the chemicals look different from eachother as well. Especially as you might want to overlap your chemicals a bit, it needs to be fairly easy to determine which chemical is what. I'll have a think about some sort of unifying theme for all the chemicals, but for the most part I think players won't have an issue with this. They stay in the map permanently and as you can only ever see your own chemicals anyway you'll know what it is because you will be the person who planted it there.